Poland was another nation to licence manufacturer the T-54/55 Medium Battle Tank and as such required a Wóz Zabezpieczenia Technicznego, which is Polish for Armoured Recovery Vehicle. 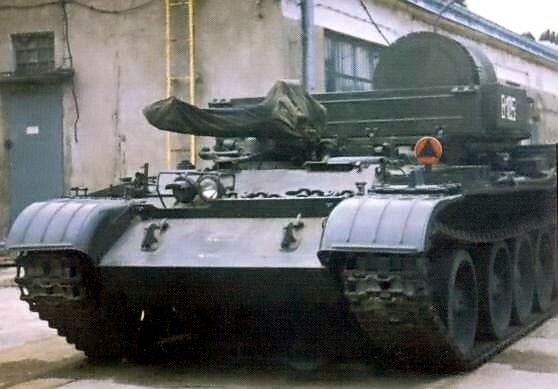 The WZT-1 was the licensed built Russian ARV based on the T-54. Production started in 1970 in “Bumar-Łabędy” and continued until 1978 when it was completely replaced by WZT-2. The WZT-2 was a Polish ARV built on the T-55 hull with the purpose of recovering the T-55. It carried the standard equipment such as stabilization blade, boom crane, winch’s, compartments for other hand held engineering equipment and towing. It entered production in Poland during 1972, with production ending in 1992, by which time 600 had been built. The vehicle is still in service with Engineer Regiments of the Polish Army for carrying out repairs to Polands PT-91 fleet and Leopard 2A4’s, however their increased size and weight means the WZT-2 can not tow them.